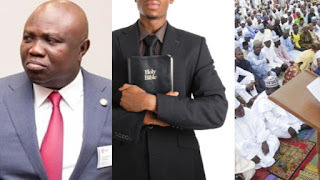 The Lagos Government has debunked claims of planning to commence paying salary to religious leaders in the state. Abdulhakeem said: “The clear position is that the Lagos State Government is not intending to employ imams and pastors. There is no such plan and there is no willingness on our part to delve into a private realm. “What exists in Lagos State is that there is a symbiotic relationship between the Lagos State Government and faith-based organisations and it is a mutually beneficial relationship which has contributed to the growth and development of the state,” Abdulhakeem said. In the said report, Abdulhakeem was quoted as saying that the state government would soon place religious leaders on the state salary structure to encourage them to use their pulpits and the minbar (pulpits in the mosque) to re-orientate citizenry to shun corruption and immorality. Already, the commissioner said a structured approach had been put in place to relate with religious leaders in the state through the Nigeria Inter-Religious Council, which consists of people nominated by the Christian Association of Nigeria and the Muslim Community across the 57 local councils in the state. “They meet regularly to interact on religious issues and Governor Akinwunmi Ambode has even further decentralised that, whereby over 700 of them were appointed, based on their nominations, and they are volunteers who are not paid anything. They come together to nip religious crisis in the bud,” he said.